To "celebrate" becoming "empty nesters" (when Dan left for college), we decided to finally sign up for one of the wonderful trips about which Fred's alma mater (Brown University) kept sending us brochures over the years. Since the family had visited Switzerland in 1994 and loved it (staying on Lake Lucerne), we were intrigued with the idea of returning and staying in the foothills of the Alps. So we signed up for: Alumni College in the Swiss Alps, a package offered to various schools through Alumni Holidays (AHI) as part of their Alumni Campus Abroad program. Brown sent along a geology professor to supplement the regular program with a few lectures on his specialty, plate tectonics. There were 40 people on our tour, and we enjoyed them immensely! We stayed at the family-owned Alpin Sherpa Hotel (which we can recommend to you) for all seven nights and took day trips. Our AHI tour guide, Irmagard Chapsky, was absolutely fabulous. She was born in Germany, lives in Southern California, and leads this tour every week for about half the year. 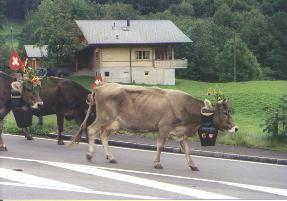 Tuesday -- "Introduction to Switzerland" lecture; trip to a Swiss farm in Gentalalp to see the cows and how cheese is made; visit to the Swiss alpine meadows of Engstlenalp (photo); further touring in Meiringen. 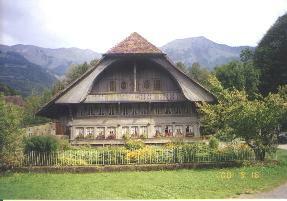 Wednesday -- a visit to the Ballenberg open air museum of 100 transplanted and restored historical buildings from all over Switzerland (photo of one of them); the Grand Hotel Giessbach and Lake Brienz; a short cruise to the woodcarving village of Brienz; and a night visit to the Aare River Gorge. Saturday -- a "free" day, where we chose to take a brief train ride to Innertkirchen to see the cows come down from the mountain for the winter, ceremoniously dressed (photo); then another train ride to Interlaken to visit the shops; and in the evening several villagers came to meet with us and answer questions. We thoroughly enjoyed this tour. AHI did a superb job, as did our tour guide. Having been to Switzerland once before, we had already decided that when we returned, we would stay in or around Interlaken ("between the lakes," the lakes being Thun and Brienz, with the villages of Thun and Brienz being at the ends of each lake and well worth visiting). 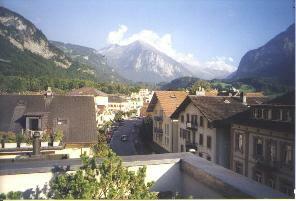 Meiringen was about a half-hour away from Brienz, nestled in a scenic valley. 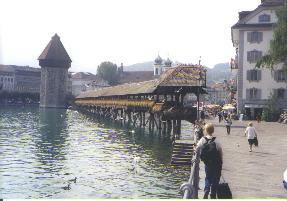 You can travel all over Switzerland by trains and busses, and this area is quite central and extraordinarily scenic. Regularly scheduled boats can take you from one end of each lake to the other, with several stops along the way. 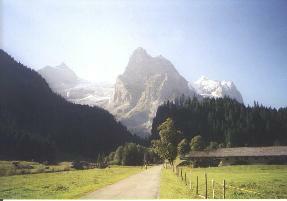 Another nearby town that we highly recommend is Grindelwald (below the Eiger and Jungfrau mountains). 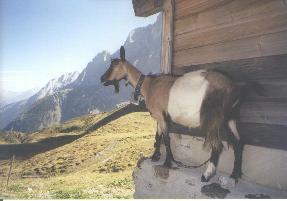 Incidentally, several tour companies appear to offer week-long tours based at the Alpin Sherpa hotel in Meiringen. The trip from Brienz on the cog railway up the Brienz Rothorn mountain was spectacular beyond words. Of course a clear day makes a big difference. On our previous trip to Switzerland we took a cog railway to the Jungfraujoch, the highest railway station in the world at 11,333 feet, but the weather was poor. That train leaves from Grindelwald and has a midway station at Kleine Scheidegg ("small divide," an alternative destination), which is not quite as spectacular a view as we saw at Grosse Scheidegg, another worthwhile destination for you (you take a bus there). The nature of the tour left us no real time to hike (not Kathy's favorite activity anyway! 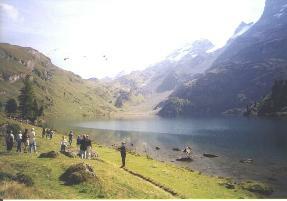 ); but from all of our destinations, there were hiking trails abound. Most are pretty well marked and include signs with the walking time to other destinations. 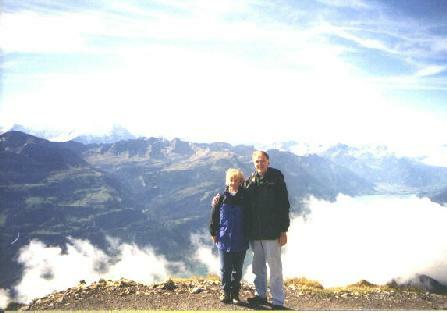 For instance, we could have hiked DOWN Brienz Rothorn mountain (3-1/2 hours) or between Reichenbach Falls and Meiringen. Regardless of your degree of interest in hiking, bring hiking shoes for safety, if you can! Most of the Swiss people (65%) speak German (plus their own dialect of German), except in the areas near France (where they speak French) and Italy (where they speak Italian). But most Swiss people in business and the service/tourist industries also speak English well. We had no trouble conversing. And the US dollar is priced favorably to the Swiss Franc. Bottom line: unless you consider mountains to be "just a pile of rocks" (as a relative reportedly once said), GO TO SWITZERLAND!